spencer moy passed his photo cuffs on to me and i thought they were pretty cute. if you're like me and tend to be kinda cheesy about pictures (i have my desk wall covered in tiny snap shots), this is right up your alley. 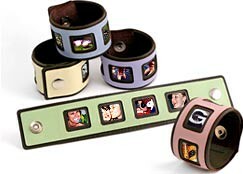 smoy photo cuffs are basically what the name implies- vinyl wrist cuffs laser cut to provide spaces for your tiny snapshots. you know, wearable photo bracelets. the simple cuff design comes in three styles: soho 1 (one frame) , soho 4 (four frames) and brooklyn (four frames with eyelets- my favorite). each one is simple and provides a pretty nifty way to carry around your camera phone photos, tiny photobooth shots and those little proofs you get with your photos at the store. designer spencer moy graduated from carnegie mellon and later worked in tokyo. after two and a half years abroad, he returned to his hometown, new york city. he'd had the idea of the photocuff sitting around for awhile and, tired of freelancing and temping, decided to take the idea off the shelf and make it a reality. now you can buy his cuffs online ($15 each) on his website. [thanks, spencer!]. These would work great with pictures taken with polaroid's i-zone. wow! this looks so cool!! 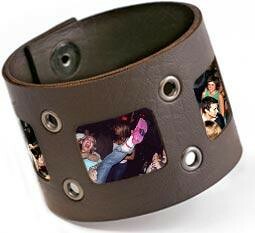 These photo bracelets are a great idea. I am sure these bracelets are very popular.